The dam's spillway in June 1973. Priest Rapids Dam is a hydroelectric, concrete gravity dam; located on the Columbia River, between the Yakima Firing Range and the Hanford Nuclear Reservation, and bridges Yakima County and Grant County, in the U.S. state of Washington. The dam is 24 miles south of the town of Vantage, and 47 miles northwest of the city of Richland. It is located at mile marker 397.1 from the mouth of the Columbia. It is owned by the Grant County Public Utility District (PUD). Priest Rapids, for which the dam was named, are now submerged beneath the dam's reservoir. Priest Rapids Dam is part of the Columbia River Basin system of dams. 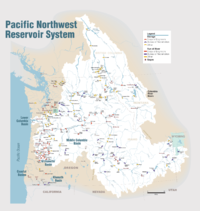 After the disaster of 1949 Vanport Flood on the lower Columbia River, around Vancouver, Washington, and Portland, Oregon, the federal government established the Priest Rapids Project under the Flood Control Act of 1950 (Public Law 81-516; May 17, 1950). The U.S. Army Corps of Engineers decided the project would not be a top priority, so the Grant PUD began looking at taking over the project from the USACE in 1952. With the passage of Public Law 83-544 in 1955, Congress gave Grant PUD the right to proceed. Revenue bonds were issued for construction to begin in July 1956, first generation occurred in 1959, and the dam was completed in 1961. Its reservoir is named Priest Rapids Lake, and extends 18 miles upstream to spillway of Wanapum Dam. Downriver from Priest Rapids Dam is Hanford Reach, the only free-flowing, non-tidal stretch of the Columbia River in the United States. An explosion injured six employees on October 8, 2015. Grant County PUD was fined $35,000 for safety violations. Leaks have been discovered in the spillway monoliths. A "non-failure emergency" was declared, and the water level behind the dam was reduced by about three feet. ^ "Priest Rapids Dam at Grant County PUD". Archived from the original on 2012-12-30. Retrieved 2011-07-04. ^ "Grant County PUD". Archived from the original on 2012-11-30. Retrieved 2011-07-04. ^ Ingram, Elizabeth, ed. (October 12, 2015). "UPDATE: Three of six employees released from hospital after explosion at Priest Rapids hydro". HydroWorld.com. Retrieved June 1, 2018. At about 4:15 pm on Oct. 8, an explosion was reported at the 955.6-MW Priest Rapids hydro facility, with six injuries. ^ Harris, Michael, ed. (April 7, 2016). "Washington fines Grant County PUD for October incident at Priest Rapids hydropower plant". HydroWorld.com. Retrieved June 1, 2018. The state of Washington has fined Grant County Public Utility District $35,000 for safety violations after six employees were hospitalized at the 955.6-MW Priest Rapids hydroelectric plant in October. ^ Harris, Michael, ed. (April 11, 2018). "Priest Rapids "stable" after drilling uncovers monolith leaks, says Grant PUD". HydroWorld.com. Retrieved June 1, 2018. Officials from Grant County Public Utility District have discovered leakage at its Priest Rapids Dam is being caused by dis-bonded lift joints in the structure's spillway monoliths. Grant PUD discovered the leak during inspection drillings late last month, causing the Washington-based utility to declare a "non-failure emergency" in which it reduced the reservoir behind the dam by about three feet.